Banking on the skills of our qualified team of professionals, we are engaged in offering Evaluation Board. 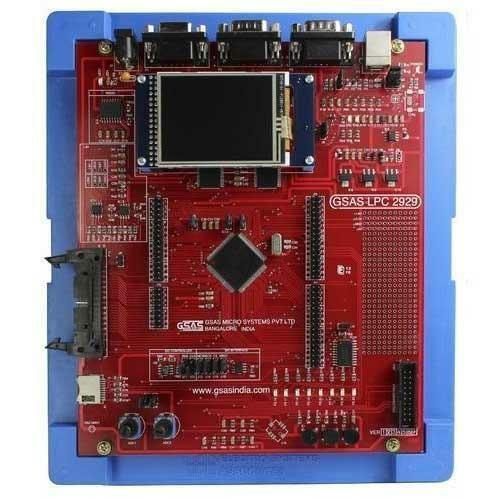 This Evaluation Board allows the user to evaluate the capabilities of the NXP LPC 21xx and create a real working environment with KEIL development tools. To attain the maximum satisfaction of customers, we provide this board at market leading price. Our company rooted itself as GSAS Micro Systems Pvt Ltd (GSASMSPL) in the year 2012 at Bengaluru, Karnataka (India). We are involved in the manufacturing a wide array of PCB Diagnosing Solutions, PCB Design Services, PCB Design Tools, Electronic Equipment Repairing Services, Analog And Digital Storage Oscilloscope, Logic Analyzers, Device Programmers, LCR Meters, Electrical Safety Testers, Analog and Digital IC Testers, Digital Microscopes, Flash Programmers, Digital Multimeters, Microprocessor and Microcontroller Trainer Kits, Interface Modules and many more. GSAS Micro Systems Pvt Ltd is one of the industry's fastest-growing global catalogs. We have established an organization as we boast of advanced infrastructure and well-equipped amenities that are technologically empowered. We offer a broad array of qualitative products. We time-to-time update our product catalog with new technological inventions in accordance with market’s changing and challenging trend. Our translucent trade methodologies, Premium packaging, Capability to supply in bulk and easy payment methodologies have given us a prominent place in the industrial abode.